Super Smash Bros. for Nintendo 3DS is the joint fourth installment and the first handheld game in the Super Smash Bros. series. Sora Ltd. and Bandai Namco Games developed these games. It was developed at the same time as its partner game, Super Smash Bros. for Wii U, but Super Smash Bros. for Nintendo 3DS was released earlier due to earlier completion. It shares many similarities in terms of content as its partner game, but it has a few exclusives, most notably, the Smash Run mode. It can also connect with its partner game and transfer customized characters between each other, and the Nintendo 3DS can be used as a controller for the Wii U version. The game requires 9,108 blocks of memory on an SD Card, if downloaded from the Nintendo eShop. Screenshots could not be posted to the game's Miiverse community from an original Nintendo 3DS model, as the game's high processing requirements stopped Miiverse from being accessible when the game is active. The New Nintendo 3DS, however, could access Miiverse, due to its improved processing power. Super Smash Bros. for Nintendo 3DS features similar gameplay to its predecessors, although it most closely resembles the engine in Super Smash Bros. Brawl. For instance, air dodging has remained the same and Final Smashes and Footstool Jumping have returned, although random tripping has been removed. The core gameplay of the Super Smash Bros. games consist of characters having percentages starting at zero. When they take damage, their percentages rise and they get more easily knocked away. A character is KO'd once that character is knocked far enough, beyond the blast line, indicated by a colorful explosion, falling in the background and turning into a star, or hitting the screen. Characters can attack with simple button commands. The button is used generally for standard attacks, and the direction of while button is pressed can dictate the direction, type, and strength of attack. Tapping while pressing initiates a Smash Attack, a strong move which is often used to score KOs. is used for special attacks, which can vary from character to character, although their up specials tend to be recovery moves. Players can shield to block attacks with . Grabbing, which can stop shielding or help position opponents, is done with . The trigger buttons have been switched from the previous Super Smash Bros. games, where one left should button is used for shielding while one right shoulder button is used for grabbing. Each character is given at least two jumps, activated by pressing , , or by pressing up on , which can be extended once with an up special move, usually. If players are knocked out of the stage, they can use these jumps to attempt to recover to the stage. Aesthetically, in the transition from Super Smash Bros. Brawl, the overall theme has been changed, with brighter and bolder colors, and character appearances and aesthetic details more closely matching the aesthetics of their series of origin. Due to the smaller screen size of the Nintendo 3DS compared to a television screen, Super Smash Bros. for Nintendo 3DS also features black outlines around each fighter. Players can adjust the outline from three options: thick, thin, and none. In addition, during a team match, regardless of the option, an outline corresponding to the team color surrounds the character, allowing players to choose any of the existing alternate costumes, rather than assigning a certain colored costume to that character to match the team color like in all previous installments. Players can customize each fighter by giving them equipment to increase specific attributes (attack, defense, or speed) while sacrificing others. Up to three pieces of equipment can be equipped at a time, and some items provide additional side effects to the fighter. Players can customize fighter's special attacks with one of three variations for each, provided that the variations are unlocked first. The Mii Fighters and Palutena, however, have custom special attacks that are completely original moves rather than variants of existing moves; these are unlocked from the beginning. Players can have up to ten custom characters saved at a time, though the player can have as many Mii Fighters as they want. Custom characters cannot be used in With Anyone online. Players can send customized fighters from one version to the other. Custom fighters transferred from one version cannot be edited on the receiving version, however. Additionally, by connecting the two games the player can use their Nintendo 3DS as a controller for the Wii U version. Link participating in a round of Smash Run. A new mode, Smash Run is a Nintendo 3DS-exclusive mode strongly resembling the City Trial mode from Kirby Air Ride while including elements of the Subspace Emissary mode from Super Smash Bros. Brawl. In this mode, players travel in a large maze-like map, fighting enemies from both Nintendo games and from Super Smash Bros. games, such as Magikoopas, Chandelures, Goombas, Shy Guys, and Kremlings. Before going into battle, players can equip powers, which have a variety of effects, such as being a more powerful attack, temporarily increasing stats, healing, or equipping the player with an item. The player can equip only a certain number of powers based on their weight, the maximum weight being determined by the player's current equipment and the fighter. While fighting, players can collect several items similar to patches. These stat boosts can increase attack power, special attack power, jumping, or movement speed; there are also special stat boosts which increase all stats. After five minutes, players are shown their final stats, courtesy of the stat boosts they collected, and they are pitted in one of several modes, similar to the Stadiums from City Trial, in which players must fulfill the given conditions to win. StreetSmash is another new game mode serving as the StreetPass functionality for Super Smash Bros. for Nintendo 3DS. Players compete against other player character's tokens with their own by charging into them to knock them off the stage. Players attack by holding down the to build up power, then letting it go and holding the Control Pad in a certain direction to charge forward into an opponent. Players can also shield by pressing , and can dodge by moving when shielding; pressing after dodging allows the player to counterattack. In StreetSmash mode players can either play against other players they have StreetPassed with or in practice mode; both allow the player to earn gold. Like previous games in the series, Classic mode has the player travel through a series of challenges to reach the end. However, this mode is shorter than before, only being six stages long. Before starting, the player can adjust the difficulty level by betting gold, exactly like the Fiend's Cauldron from Kid Icarus: Uprising; a higher difficulty yielding better rewards. The player can also choose to lower the intensity below 2.0, but has to pay 5G for every level decrease that's made. Intensity level 2.0 doesn't require any gold to play. If at any point the player gets a game over, the intensity level automatically lowers itself by .5 if they decide to try again. However, the intensity will never drop below 2.0; if the player plays on a difficulty lower than 2.0 and gets a game over, the intensity also does not lower. Before each challenge, the player travels across a map, and they can select which challenge to face by taking one of the diverging paths colored by difficulty, with blue being the easiest, green being medium, and red being the hardest; opponents are based upon the characters the player has unlocked, and unlocking any characters allows the player to face them in Classic. After each match, the player can receive various rewards, including gold, trophies, and custom parts; the exact type of reward depends on the results of a roulette before the battle. As the intensity increases, so does the number of rewards. 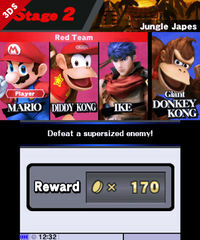 Classic Mode consists of six rounds: four are normal, the fifth involves fighting 10 enemies that are significantly easier to launch (either a "team" of a character or the Fighting Mii Team), and the final round is a boss fight. The player can face either Master Hand or, if the intensity is 3.0 or higher, the player can choose a black path to fight both Master Hand and Crazy Hand. (If the intensity is 8.0 or higher, then only the black path will be available.) If the intensity is 5.1 or higher, the player must also fight the Master Core. The number of its forms the player will have to fight varies depending on the intensity level. All-Star mode also returns from Super Smash Bros. Melee and Super Smash Bros. Brawl and up to two players can play together locally just like the latter game. In this mode, players fight against every playable character (except for the Mii Fighters) until they reach the end; this time, however, characters are organized by time periods they were introduced in rather than by series. All-Star Mode is also available from the beginning of the game, though the player can only play against the default roster until every character is unlocked. After each match, players may be given a reward, and occasionally a trophy or custom part will appear in the break room. The break room also gives the player a Maxim Tomato, Fairy Bottle, and Heart Container to heal between matches; in the full All-Star mode, the player is given a second Heart Container. However, the items will not return once consumed unless the player starts over. When All-Star Mode is cleared, the player earns a trophy of an alternate color of their character rather than a Final Smash trophy like in the previous game. *- Only available in the full All-Star mode. **- Downloadable content. Only available in this mode after downloading (characters only available in the full All-Star mode), but it will be removed from the list if the player deletes the game's DLC data. Inclusion does not affect any of the game's challenges. Training also returns from previous games, identical to the previous games. Within Training, players can train against a computer opponent, and can automatically select items that appear, game speed, the number of CPU opponents, their behavior, and the current amount of damage for all players. The player can also adjust the camera view and toggle the info display at the top of the screen, as well as restart the session or quit. In Stadium mode, three different games are available: Multi-Man Smash, Home-Run Contest, and Target Blast. The Home-Run Contest works like in previous games, in that players have ten seconds to build up damage on the Sandbag before having to launch it as far as they can. 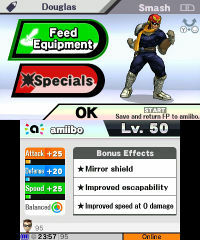 Several tweaks have also been made to this mode from Super Smash Bros. Brawl, such as having a more durable shield. 10-Man Smash - The player must defeat ten enemies. 100-Man Smash - The player must defeat 100 enemies. 3-Minute Smash - The player must defeat as many Miis as possible in three minutes. Rival Smash - A brand new mode, in which players compete against a computer version of themselves to defeat as many enemies as possible before being KO'd. Once KO'd, however, only the difference between scores is counted as the player's final score; if the player KO's less Miis than the opponent, their score is zero. Endless Smash - The player must defeat as many enemies as possible before being KO'd. Cruel Smash - The player must fight against more difficult enemies that can easily KO the player, and defeat as many as possible. Target Blast functions like a combination of the Home-Run Contest and Target Smash in previous games. In this mode, players have ten seconds to attack and launch a bomb to destroy as many targets as possible; the countdown starts as soon as the player starts attacking. There are fourteen large, red targets and several more smaller, green amongst structures that must be broken through; a trophy, piece of equipment, or special move may also be among the targets. Also scattered throughout are explosives that can be detonated by having the bomb touch them. The player has two rounds to break as many targets as they can and accumulate the highest score possible. Within the vault, players can view collected trophies, snapshots taken during play, and saved replays; listen to the game's music and voices in the sounds menu; view records; and view a series of tips. There are a total of 707 trophies in the 3DS version. Within the trophies menu itself, players have the option of viewing their collected trophies or earning more by either buying them in the shop or by playing the Trophy Rush minigame. In Trophy Rush, the player must pay gold to increase the amount of time they spend in the minigame, the minimum being thirty seconds and the maximum being 2:30. In the game itself, players must attack crates and rock blocks as they fall from above to destroy them; destroying multiple consecutively creates a chain that increase the player's score. Bomb blocks also fall and explode after three seconds. Destroying the falling blocks builds up a meter that, when full, initiates "Frenzy", in which gold, trophies, and on occasion custom parts fall from above for the player to collect. If the blocks and crates reach above a certain point or the player falls off the stage, the stage disappears, clearing the board and, in the case of the former, costing the player time. Also returning from Super Smash Bros. Brawl are Challenges. In this mode, players are given a board of challenges which can be completed by clearing the given criteria. Clearing a challenge unlocks a picture on the top screen as well as a trophy, custom part, stage, CD, Smash Run power, or Poké Ball Pokémon. Completing a certain number of challenges on a given panel unlocks a new panel of challenges. Occasionally the player will also be rewarded with a Golden Hammer, which can be used to automatically clear a challenge. This game features online play similar to Super Smash Bros. Brawl in that players from all over the world can face others in matches. When playing With Friends, players can customize the rules to their liking. When playing With Anyone, two basic options are available: For Fun and For Glory. In For Fun mode, players battle on randomly-selected normal stages, excluding Final Destination, with all items turned on. Losses are not recorded in this mode. In For Glory mode, players only play on the flat, Final Destination versions of stages, without items. 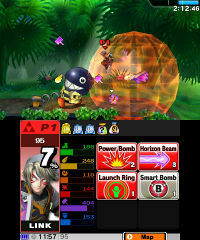 Players can either play standard Smash or Team Smash matches in both modes, and For Glory offers a 1-on-1 mode as well. Conquest became available in the Nintendo 3DS version through an update on September 15, 2014 in Japan, and October 2, 2014 in all other regions. Conquests pit some of the game's various characters against each other, and players who win battles with them in With Anyone mode will add points to that character's score. After a few days, the winning fighter is revealed, players who took part in the conquest by playing as that character get rewarded with gold, and the next conquest begins. Spectate mode allows players to view matches and bet gold on their outcome, view replays of past online matches, and view a map showing the players currently online. As of version 1.0.5, there is also a Share mode, which allows players to send and download screenshots, replays, and Mii Fighters from around the world. Players can share their Mii Fighters and replays with friends or post them to the server, while snapshots can also be posted to Miiverse. When searching for replays players can search by their creator (self, anyone, or friends), location, mode, stage, and character; when searching for snapshots or Mii Fighters, players can search by creator, location, and, in the case of Mii Fighters, the type of fighter. Rather than an online leaderboard, the game makes use of a different type of ranking system, called "Global Smash Power". A player's GSP score is recorded for each of the various single-player modes, the number indicating how many players around the world they outrank. Complete character select screens, including downloadable content. Counting the three types of Mii Fighters as individual characters, the Koopalings and all downloadable content, Super Smash Bros. for Nintendo 3DS features a total of 58 playable characters, the roster being consistent across both games. The base roster consists of 51 characters (counting each Mii Fighter), featuring 36 returning characters and 15 new ones. In addition, 36 characters are available by default, while 12 more can be unlocked, and Mii Fighters can only be chosen when one is created. Finally, seven characters have been released as downloadable content: returning fighters Mewtwo, Lucas, and Roy, and newcomers Ryu, Cloud, Corrin, and Bayonetta. The character selection screen is divided up into two sections: Original Fighters, characters already part of the core game, and Extra Fighters, characters purchased as downloadable content. To keep the rosters consistent across both games, certain characters and features have been removed, partly due to limitations with the Nintendo 3DS hardware. One of the removed features was mid-battle transformations, leading to Charizard, Sheik, and Zero Suit Samus to be added as separate characters. NOTE: Characters in italics are newcomers. *Duck Hunt is referred to as Duck Hunt Duo in PAL regions. There are 42 stages in this game, with most of them being based on handheld games. Each stage has two songs, with players being able to play the alternate song by holding the button while selecting a stage. Additionally, players can toggle between playing on "Final Destination" variations of all stages (represented by a "Ω") in addition to playing on the standard versions, being a flat course with no obstacles or other platforms. Stages listed in italics are unlockable. Extra Stages are downloadable stages that are either bundled with certain DLC characters or can be purchased individually, with the exception of Duck Hunt, which is added to the game for free through a software update. Battlefield is one of the game’s more straightforward stages, whose appearance has remained constant since Super Smash Bros. Melee. The stage consists of the base platform and three floating platforms the players can jump and fall through. The stage also cycles between day and night, though it does not effect the gameplay. Final Destination consists of only a single long platform, the most basic of stages. It is where the final fight between the player and Master Hand, Crazy Hand, and Master Core takes place. This stage is based on several levels from Super Mario 3D Land. The stage auto-scrolls between areas, each with their own obstacles. Areas consist of blocks, floating platforms, Skewers, rotating platforms, and moving platforms. This semi auto-scrolling stage is based on World 1 from New Super Mario Bros. 2, featuring three variously design structures that occasionally alter between each other. Coins can be found in the stage, and collecting 100 of them will give fighters an increase in attack power and launch resistance. Based on the 3DS Rainbow Road from Mario Kart 7. As the main platform travels through the course, it will occasionally stop for fighters to fight on the track. Shy Guys will occasionally drive through the match and will damage the players should they hit them. True to its origin of the Paper Mario series, the stage is designed like a paper diorama and folds out like a book when changing in between three layouts based on locations from the series' installments, each with their own obstacles. This stage, returning from Super Smash Bros. Brawl, is based on World 1-1 from Super Mario Bros.. The stage will auto-scroll throughout the course, and ? Blocks can holster items for players to use. This stage, returning from Super Smash Bros. Melee, contains a long platform in the center with two smaller ones to the sides. A semi-solid platform is also located above the main platform. Water runs underneath the stage and can sweep the player off screen if they get caught in it. This stage is based on the bridge at the entrance to Gerudo Valley seen in The Legend of Zelda: Ocarina of Time and its 3DS remake. The bridge can be destroyed, in which case the characters Koume and Kotake will appear and cast spells on the stage. This stage has players fight on the Spirit Train from The Legend of Zelda: Spirit Tracks. The train is constantly in motion and any players who step off the train will be swept to the right. The train can also change its back car and can be attacked by Dark Trains in the middle of battle. This stage, based on Brinstar from Metroid, returns from Super Smash Bros. Melee. It has a few semi-solid platforms and the main stage can be split. Acid will also rise, damaging the players if it makes contact. This stage is based on elements from Super Mario World 2: Yoshi's Island and is a returning stage from Brawl. The long semi-solid platform above the main stage tilts on its center axis over time and two other platforms can rise up from the sides. This stage is based on Kirby's Dream Land and has a Game Boy motif around it. It shifts between several locations from the game and the music changes accordingly. This stage, returning from Melee, takes place on the Great Fox from Star Fox. Arwings and Wolfen appear throughout, attacking the players with their laser cannons. Additionally, the large cannon on the bow of the ship can deliver a one-hit KO to players. This stage is inspired by the Pokémon League from Pokémon's fifth generation region, Unova. The stage layout is basic, and various legendary Pokémon will appear in front of N's Castle. When Reshiram or Zekrom appear, they are able to affect the battlefield, with the former by setting the stage ablaze, and the latter is able to tilt the stage. This stage takes place at the Prism Tower in Lumiose City from the Kalos region. The stage, which consists of one main platform and several semi-solid platforms, travels across the tower as the fighters battle it out, along with battling on the tower itself. This stage is based on Mute City from the original F-Zero. Two platforms hover over the racers as the players battle and players can stand on the race cars as they come and go. Touching the track will damage the players. This unusual battleground is based on two similarly named locations from Mother and EarthBound. Fighters will brawl on a series of clouds, with various objects from EarthBound appearing, such as the Dungeon Man and the Sky Runner. The Flying Man may also appear to give a hand to fighters, but only five will appear each match. Arena Ferox will first appear as a basic stage, but over the course of the battle, several platforms will rise up from the ground. Platforms consist of basic, semi-solid, and moving platforms. This returning stage places fighters inside of a Game & Watch device. The stage changes between four areas based on four Game & Watch games; Fire, Oil Panic, Lion, and Chef, each come with their own sets of obstacles. This stage is based on Chapter 11 of Kid Icarus: Uprising. The first part of the stage consists of a few platforms, while the second contains breakable platforms over a large abyss. Returning from Super Smash Bros. Brawl, this stage is based on the WarioWare series. The stage will occasionally have players participate in microgames, which if completed correctly, will give the successful players a reward (or, occasionally, nothing at all). This stage is based on elements from Pikmin and is a returning stage from Brawl. A large Red Bulborb appears to the right side of the stage and will attempt to eat the players. Additionally, when raining, water will come from the left side of the stage and push the players off stage. Based on Tortimer Island from Animal Crossing: New Leaf, this stage's orientation changes each time it's played on. Stage can consist of tree that act as platforms or a pier to the side. Players can swim in the water, but sharks can attempt to bring players down. Based on a boxing ring, this is a fairly simple stage with no pits to fall into. Players can jump on the ropes to reach the spotlights at the top, which they can attack to send them crashing down. The ring can also change its theme when selecting it, based on either Punch-Out!! or Super Smash Bros.
Based on the large area on the lower level of Bionis' Leg from Xenoblade Chronicles, this stage is the largest stage in the game. It has various platforms modeled onto two cliffsides to fight on. However, they are in between a very large gap, requiring very precise jumping to cross. Like Battlefield, it features a shift between day and night, but the effect is cosmetic. The stage's 8-bit appearance can change when selected, but it normally contains several platforms, one or two Flippers, lightning clouds, and a water hazard with a large fish that will attempt to bring players under. The stage can also be walked off to the side and the player will appear on the opposite end, unless they are knocked off in that direction. Taking place in a large living room, players will first battle on a large floor. Once enough time has passed, blocks and other objects will fall onto the stage, damage players if they connect, but can be walked on when they have rested into place. A stage based on the game Find Mii II from the StreetPass Mii Plaza. The stage consists of one large platform to the left and a smaller platform to the right. The Dark Emperor can also take part in the stage, increasing certain player's stats. Based on the game of the same name, this stage is a large house with several semi-solid platforms the players can fight on. Various Miis from the user's system appear in the rooms. Based on the PictoChat application built into earlier Nintendo DS models, various drawings will appear, having different impacts on the fight. This stage is similar to the PictoChat stage from Super Smash Bros. Brawl, but PictoChat 2 features different drawings. A stage returning from Super Smash Bros. Brawl. It has a "u-shape" design and the lower ground section can be broken. Checkpoints also appear occasionally, which can be attacked to make it spin and damage other players. A stage based on Wily Castle from Mega Man 2. Several platforms move around the main one, which can disappear or fly off the stage without notice. Yellow Devil can also momentarily appear and intervene with the fight. This stage is designed after the classic maze from the original Pac-Man arcade game, featuring the four ghosts and Pac-Dots. If one collects enough Pac-Dots, or any of the Bonus Fruit, a Power Pellet of their color will appear, granting immunity to the ghosts. A stage returning from Super Smash Bros. It features Whispy Woods, who will occasionally blow wind in a random direction, which can cause fighters to fall off of the stage. Otherwise, its appearance is similar to Battlefield. Ryu's home stage, based on the same location from Street Fighter II. It has two large platforms on the right and two smaller platforms to the left. Its Omega Form features breakable signposts, though they do not effect gameplay. A stage returning from Super Smash Bros., this stage contains elements from Super Mario 64, along with a Smash Bros. Bumper hovering over the stage. The stage has one, long semi-solid platform over a small platform. There's another platform that moves from side to side underneath and slanted platforms to the sides of the stage as well. A stage returning from Super Smash Bros., based on Hyrule Castle from The Legend of Zelda: Ocarina of Time. It contains several platforms as well as a tornado that appears occasionally, sending players that get too close into the air. A stage based on Super Mario Maker. The stage is randomly generated every battle. It alternates between styles during battle, and any destroyed terrain is replaced once enough time has passed. A stage originally from Super Smash Bros. for Wii U. It is based on the Duck Hunt game, with trees that act as platforms and ducks the player can attack. Midgar is the city from FINAL FANTASY VII and Cloud's home stage. Midgar shares a similar appearance to Battlefield, though Materia appears occasionally throughout the battle. This Materia can summon creatures from FINAL FANTASY VII which can affect the stage in various ways. A piece of the falling clock tower from the opening of Bayonetta and the home stage of the titular character. While the stage itself is completely flat, pieces of debris may fly by to serve as platforms. *** - Returning stages from Super Smash Bros.
Super Smash Bros. for Nintendo 3DS features many new items. 75 items, 26 of which are new, appear in this game. In both games, Assist Trophies return. 37 Assist Trophies are featured, of which 21 are new, and the other 18 are returning from Super Smash Bros. Brawl. In Super Smash Bros. for Nintendo 3DS, this set of 40 Pokémon, 23 new features more focus on the fifth and sixth generations, but still contains Pokémon from previous generations. The Wii U and 3DS versions have the same amount of Pokemon. Several Pokémon such as Chikorita, Munchlax, Piplup, and Torchic, however, have been removed or replaced from the previous games. Super Smash Bros. for Nintendo 3DS has been generally praised by critics for taking the Super Smash Bros. formula and successfully putting it on a handheld device, as well as for the amount of content it has and the variety of customization options. The version-exclusive Smash Run mode has also met positive reception as a nice diversion from the standard gameplay. The graphics and gameplay have received overall praise, though several critics have noted issues with the game's controls, as well as the Nintendo 3DS's screen size being too small to keep track of the gameplay. The online mode has also been a point of contention, being prone to slowdown and input lag. Josh Harmon, EGM 9.0/10 "Super Smash Bros. for Nintendo 3DS manages to feel like a complete and worthwhile step forward for the franchise, even though you might occasionally wish for the precision of a real controller." Jose Otero, IGN 8.8/10 "Smash 3DS is impressive and, for the most part, feels right at home on 3DS. The multitude of ways to play and awesome customization gave me many reasons to keep fighting ... . It all produces a fun feedback loop of engaging in matches to unlock custom moves and trophies, then jumping into another match to try out the new stuff. Even the online modes feel carefully considered and focused on what the series does best, and what the 3DS can reasonably do. It’s a little disappointing that the four-player antics that are the best part of the console games don’t really work on a small screen, but there’s still more than enough that does work to make Smash a great 3DS game." Daniel Starkey, GameSpot 8/10 "I found so much raw joy in my time with Super Smash Bros. 3DS. And even though I played to the point where I was literally in pain, I didn't have to keep playing Smash Bros. 3DS. I wanted to." Martin Watts, Nintendo Life 9/10 "As the wealth of modes, stages, characters, and other features prove, this isn't a quick release intended to tide over players until the Wii U version comes along. Rather, it delivers more than a 3DS game should feasibly be able to do, so much so that it’ll be enjoyed alongside its HD counterpart and in its own right for years to come." Jim Sterling, The Escapist 4.5/5 "While designed for your pocket, Super Smash Bros. for Nintendo 3DS does not skimp on the features. A full-fledged Smash game, packed with stuff to discover, and boasting a roster of familiar and thoroughly inventive new characters, this is a beautiful fighting game than everyone can enjoy. Just a shame that the online isn't that hot." Griffin McElroy, Polygon 9/10 "Super Smash Bros. 3DS hasn't been compressed as much as it has been tailored. And as unlikely as it may be, it fits like a glove." Jeff Cork, Game Informer 9.25/10 "We all know the Wii U version of Super Smash Bros. is on the horizon, but the 3DS version is more than something to keep you busy until then. It’s a must-play for Smash fans." Within two days of its Japanese release, Super Smash Bros. for Nintendo 3DS sold over one million copies, combining both physical and digital sales. Sales of the physical game totaled at 944,644 units for its launch, selling through 93.45% of its initial shipment. The game was also the highest-selling game that week in Japan. Additionally, the game sold 705,000 copies in two days on its launch in the United States. On October 7th, 2014, four days after the international launch of the game, Nintendo announced that Super Smash Bros. for Nintendo 3DS had sold over 2.8 million copies worldwide. On October 29, 2014, it was announced that the game had sold 3.22 million copies worldwide since its original Japanese release. At The Game Awards 2014, the Nintendo 3DS version received nominations for the "Best Mobile/Handheld Game" and "Best Fighting Game" awards. However, it did not win either of these awards. A downloadable demo for Super Smash Bros. for Nintendo 3DS was released on the Japanese Nintendo eShop on September 9, 2014, and was released internationally on September 19; however, select Platinum rank Club Nintendo members who achieved the status during the 2013-2014 year and have registered a Nintendo 3DS and software were e-mailed four download codes for an unlimited use version of the demo. The demo requires 1016 blocks of space and the public version has 30 uses. The only mode available for play in the demo is Smash, playable both in solo and multiplayer via Download Play, though in the Games and More menu players can access the Tips option. Only Mario, Link, Pikachu, Villager, and Mega Man can be used in the demo. Each character also has only three alternate costumes available. The only stage available for play is Battlefield, both in normal and "Final Destination" form. A select number of items appear, though only when playing on normal Battlefield, and each match is by default a two minute time match. Note that the latest version of the game is required for online play. Most updates also invalidate replay data saved before the release of the update and therefore cannot be viewed. An update for Super Smash Bros. for Nintendo 3DS was released on launch day in Japan, updating the game to version 1.0.1. While players who buy a physical copy must manually download the update, the downloadable version comes with the update preinstalled. The update adds online functionality as well as Conquest mode, which started on September 15. On September 15, Nintendo announced a second update for the game, meant to fix a glitch in the online mode that accidentally bans players who play as Peach in the For Glory lobby. The update was released on September 19, 2014, updating the game to version 1.0.2. The update fixes the aforementioned glitch as well as making other unspecified changes. The update was also made available for the international versions of the game on October 2, 2014, updating the game to version 1.0.2 like the Japanese version and also allowing players to have the update in advance of obtaining the game. On October 17, 2014, a third update for the game was released, updating the title to version 1.0.3. The update makes adjustments to the balance of the game, and hides the current Conquest statistics. 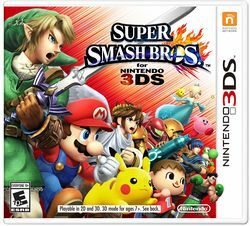 A fourth update for Super Smash Bros. for Nintendo 3DS was announced on November 11, 2014, and was released on November 18, 2014. The update fixes the Giant Yoshi Glitch, and balancing issues. Replays saved before the update also cannot be viewed, and players also cannot play locally against other players who have not downloaded this update. If players access their game data after updating to version 1.0.4, they will be required to have the update. If the update gets deleted, the game will no longer allow the players to access their game data until it's reinstalled; if the update isn't reinstalled, players will play a new game that never saves. The fifth game update adds Amiibo compatibility into the game for New Nintendo 3DS XL systems. 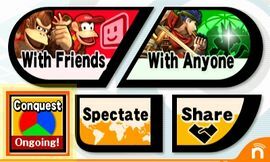 The update also adds Share mode to the Online menu, which allows players to post photos, replays, and Mii Fighter data online, as well as share it with others on their friend list. Players can also upload photos to the Miiverse Snapshot Sharing Community. The sixth software update for this game was released on the same day Mewtwo releases for Club Nintendo members who registered their games and the additional Mii costumes. The update adds the ability to purchase downloadable content in-game, as well as making adjustments to the character balance. If players access their game data after updating to version 1.0.6, they will be required to have the update. The update is also required to use any of the DLC contents that the players have purchased. Announced April 16, 2015, the seventh update for the game fixes a glitch in which creating Global Smash Power data for Mewtwo causes a bug that does not allow players to access online modes, since the data is interpreted by the game as invalid. The patch also makes tweaks to the gameplay, and like the other previous updates replays saved under previous versions of the game can no longer be viewed. Update 1.0.8 adds the ability to purchase the latest set of downloadable content, as well as amiibo compatibility in advance of the release of the NFC reader/writer for players using a standard Nintendo 3DS system. Some gameplay adjustments have also been made. Update version 1.1.0 adds compatibility with the latest wave of downloadable content, as well as making various other gameplay adjustments. Players also receive the K.K. Slider Hat and Outfit for free upon updating. The 1.1.1 update allows users to download the latest set of downloadable content. The update also adds the Duck Hunt stage from Super Smash Bros. for Wii U to this game for free. The version 1.1.2 update only fixes a glitch introduced in the previous update, causing Diddy Kong to be immune to grabbing after shielding against a multi-hit attack. Version 1.1.3 adds compatibility with the Cloud + Midgar Stage DLC pack and the Mii costumes released on the same day. Version 1.1.4 adds compatibility with the Corrin, Bayonetta + Umbra Clock Tower, trophies for the Nintendo 3DS version, two music tracks from Fire Emblem Fates and Mii costumes all on the same day. Version 1.1.6 includes new changes only for Bayonetta. Version 1.1.7 adds amiibo compatibility for Cloud Strife, Corrin, and Bayonetta. Facing an amiibo (FP) in battle. As of the version 1.0.5 update, Super Smash Bros. for Nintendo 3DS, like the Wii U version, supports amiibo functionality, though only with New Nintendo 3DS systems; a peripheral was later released to add compatibility to the other Nintendo 3DS systems, and amiibo compatibility in this game for these systems was added in the 1.0.8 update. Both games are also the first games for their respective consoles to feature amiibo compatibility. The Super Smash Bros. line of amiibo launched alongside the Wii U game as the first line of amiibo figurines; the Super Smash Bros. line is being released in waves, with every fighter planned to receive an amiibo. Using these figures in-game allows players to have the figure's character appear as a type of computer player called a "FP" ("Figure Player") and fight, either with or against the player. When the amiibo is initially scanned, it starts at level one, and every time an amiibo competes in battle, it increases its level and battle stats, the highest level being fifty. From the amiibo menu, the player can customize their amiibo by setting its owner and giving it a nickname and alternate costume, and change it special moves and statistics by feeding it equipment. amiibo learn to fight based on the player's playstyle, emulating the player's fighting style and adapting to it as it grows; this growth continues even after the FP has reached level fifty. The FP's stats are saved to the amiibo itself, allowing the player to use their individual amiibo on any copy of the game. Finally, amiibo also collect gold and items such as trophies, equipment, and custom moves as it battles, which can be obtained from the amiibo menu. The cover to the soundtrack. 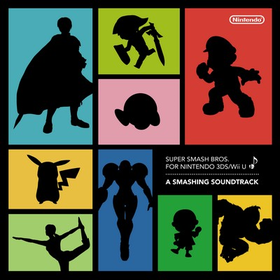 A two-disc soundtrack for Super Smash Bros. for Nintendo 3DS / Wii U was released exclusively on Club Nintendo. Members who registered a copy of both the Wii U and Nintendo 3DS game before January 13, 2015, can obtain a copy of the soundtrack. The red disc contain tracks from the Nintendo 3DS game, while the blue disc contain tracks from the Wii U game. According to Masahiro Sakurai on Famitsu, he was planning on adding the Ice Climbers for Super Smash Bros. for Nintendo 3DS / Wii U, but despite the characters running without problems on the Wii U version, the team had trouble getting the Ice Climbers working in the Nintendo 3DS version due to issues on the hardware power. However, remnants of their chant in the game can be found through a glitch. For this subject's image gallery, see Gallery:Super Smash Bros. for Nintendo 3DS. ↑ Koneko, Kirara (March 19, 2015). Korean Nintendo Direct Roundup. Nintendo Everything. Retrieved March 20, 2015. ↑ S. Good, Owen (September 13, 2014). Super Smash Bros. on Wii U will allow players to use a 3DS as a controller. Polygon. Retrieved September 15, 2014. ↑ Whitehead, Thomas (September 16, 2014). Super Smash Bros. for Nintendo 3DS Sells Over One Million Copies in Launch Week. Nintendo Life. Retrieved September 16, 2014. ↑ Ishaan (September 17, 2014). This Week In Sales: Super Smash Bros. 3DS And Destiny Siliconera. Retrieved September 28, 2014. ↑ Hanson, Kyle (September 23, 2014) Super Smash Bros. 3DS Has Nearly Sold Out in Japan Attack of the Fanboy. Retrieved September 28, 2014. ↑ SUPER SMASH BROS. FOR NINTENDO 3DS SELLS 705,000 UNITS IN TWO DAYS, 55 PERCENT INCREASE IN HARDWARE. Nintendo Pressroom (October 16, 2014). Retrieved October 17, 2014. ↑ Updates on Super Smash Bros. Wii U, amiibo, and Captain Toad. Nintendo of America (October 7, 2014). Retrieved October 8, 2014. ↑ Crossley, Rob (October 29, 2014). Nintendo Reveals Profit Turnaround as Wii U Sales Double. GameSpot. Retrieved October 29, 2014. ↑ 16.0 16.1 Four Ways to Enjoy the New Super Smash Bros. for Nintendo 3DS Demo (September 12, 2014). Nintendo. Retrieved September 12, 2014. ↑ Brian (September 9, 2014). 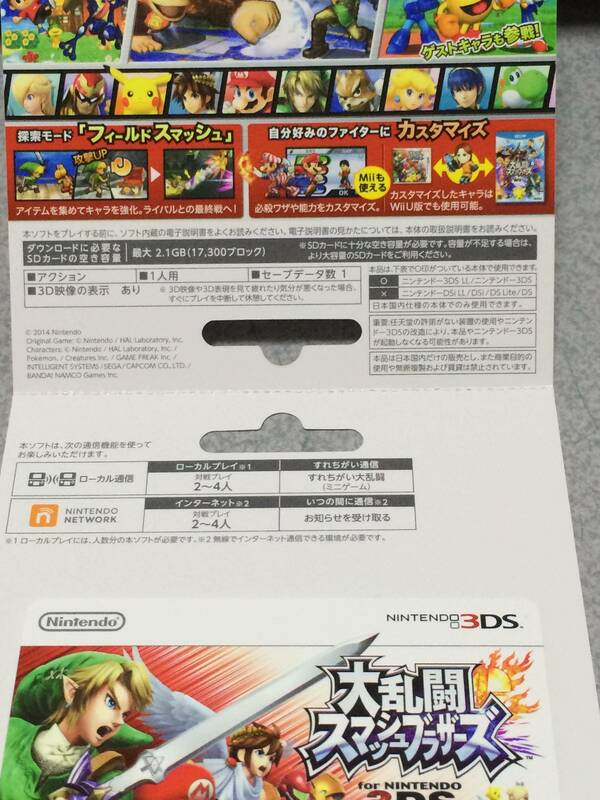 Smash Bros. 3DS demo out in Japan. Nintendo Everything. Retrieved September 10, 2014. ↑ (Translated) Miiverse comment by Masahiro Sakurai on September 10, 2014. ↑ (Translated) Miiverse post by Masahiro Sakurai on September 10, 2014. Retrieved September 10, 2014. ↑ Super Smash Bros 3DS Demo - Battlefield & Link's Final Smash (3DS Direct-Feed Gameplay). YouTube. Retrieved September 10, 2014. ↑ Spencer (September 12, 2014). Super Smash Bros. For 3DS Patch Adds Conquest Battles Starting September 15. Siliconera. Retrieved September 12, 2014. ↑ Mak, Jocelyn (September 15, 2014). Nintendo Issuing Patch For Princess Peach Bug In Smash Bros 3DS. Mii-Gamer. ↑ Brian (September 18, 2014). Smash Bros. 3DS - 1.0.2 update out now in Japan. Nintendo Everything. Retrieved September 23, 2014. ↑ Are you ready for Super Smash Bros. for Nintendo 3DS? (October 2, 2014). Nintendo. Retrieved October 2, 2014. ↑ Angello, Anthony (October 27, 2014). Super Smash Bros. 3DS update balances for your Conquest pleasure. Joystiq. Retrieved October 27, 2014. ↑ Makuch, Eddie (November 11, 2014). Super Smash Bros. 3DS Patch Tweaks Balance, Blocks Replays. GameSpot. Retrieved November 11, 2014. ↑ 29.0 29.1 Nintendo (April 1, 2015). Nintendo Direct 4.1.2015. YouTube. Retrieved April 3, 2015. ↑ 30.0 30.1 Grey, Jonathan (April 24, 2015). Mewtwo online breaking glitch fixed in 1.0.7 patch for Super Smash Bros. 4 out now. EventHubs. Retrieved April 25, 2015. ↑ Brian (April 16, 2015). Nintendo working on a patch for Smash Bros. online connectivity issues relating to Mewtwo. Nintendo Everything. Retrieved April 19, 2015. (Original Japanese announcement). ↑ Whitehead, Thomas (July 30, 2015). Super Smash Bros. Version 1.1.0 Update is Now Live. Nintendo Life. Retrieved July 30, 2015. ↑ Whitehead, Thomas (October 6, 2015). Upcoming Super Smash Bros. Patch Will Make Diddy Kong Less Obnoxious. Nintendo Life. Retrieved October 6, 2015. ↑ Brian (December 15, 2015). Smash Bros. Wii U/3DS version 1.1.3, Cloud and Midgar stage out now. Nintendo Everything. Retrieved December 27, 2015. ↑ Super Smash Bros. for Nintendo 3DS on the official amiibo website. Nintendo. Retrieved April 15, 2015. ↑ Super Smash Bros. Offer. Nintendo. Retrieved September 13, 2014. ↑ Nintendo of America (October 23, 2014). Wii U - Super Smash Bros. for Wii U 50-Fact Extravaganza. YouTube. Retrieved April 15, 2015. ↑ Sakurai mentions about the Ice Climbers had trouble developing on the Super Smash Bros. for Nintendo 3DS. This page was last edited on April 14, 2019, at 18:20.